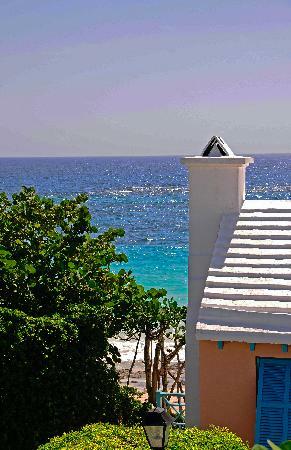 We have two, two-bedroom cottages located on the beach at Grape Bay, Paget - one of the few beach front properties offering visitor accommodation in Bermuda. Both cottages are of similar layout but each is unique. Beach Crest, often called the 'upper cottage', has two bedrooms, living/dining room, bathroom and kitchen. There is a covered porch which opens onto a lawn and open patio. The patio overlooks Beach Home and the waters of Grape Bay. There is a pathway and stairs down to the beach. Beach Home, the 'lower cottage', is very similar to Beach Crest but directly overlooks the beach. The patio is slightly smaller with a rail but affords a beautiful view of Grape Bay Beach. Both cottages have full kitchens, cable television and DVD player (we have a good selection of DVDs available to our guests), WiFi internet, air conditioning, charcoal barbeque and a selection of beach chairs, sun loungers, umbrellas and a drinks cooler! Grape Bay Beach is a private beach centrally located in Paget. The Capital City, Hamilton, is about ten minutes away by taxi or bike. Grocery stores and a pharmacy are about twenty minutes walking distance with about a fifteen minute walk to the main bus route. Click Here to see map. The beach is generally fairly quiet and has numerous sand and rock pools at the eastern end which are ideal for smaller children, and older children will enjoy playing in the waves. During the peak of Summer, our 'Sea Surface Temperature' is typically about 83 degrees. Please browse the Gallery page for some photos and e-mail or call us for any additional information. For independent reviews from previous guests see Reviews on Trip Advisor. Grape Bay Cottages have been owned by the Frith family for many years and in 2007 Maria Frith took over the management of the cottages. Since then Doug and Maria Frith have made it their aim to ensure every guest at Grape Bay Cottages has a perfect vacation exprience. Maria says, "We try hard to understand what each individual family is looking for in a Bermuda vacation and then do our best to make it happen. We always hope that when our guests are leaving they will say, 'That was a perfect vacation!'" Deposit:- We require a non refundable deposit of 2 nights rental to secure a reservation. We will hold accommodation dates provisionally for two days to allow you time to confirm that airlines etc. are available. After two days the dates will be released unless we hear from you to confirm the reservation. Deposit is payable immediately once the reservation is confirmed. Balance:- Balance is due 30 days prior to arrival. If reservation is cancelled more than 30 days before arrival date the balance will be refunded (less associated costs). If reservation is cancelled or changed less than 30 days prior to arrival, for any reason, no refund will be given. We highly recommend guests purchase travel insurance should there be any chance of the reservation needing to be cancelled. Please note that mail takes about 2 weeks to reach Bermuda.